I’m still board gaming as much as ever (last year’s post) but I feel like my rate of game acquisition has slowed. Dave, Craig, Pinguino, and I are still regularly playing and having a consistent group of people has really made it fun to run more campaign or scenario style games. Our game night at Two Bit Circus is also still on Tuesdays every fortnight. It’s been going for six years now and we picked up a few more people in the last year. 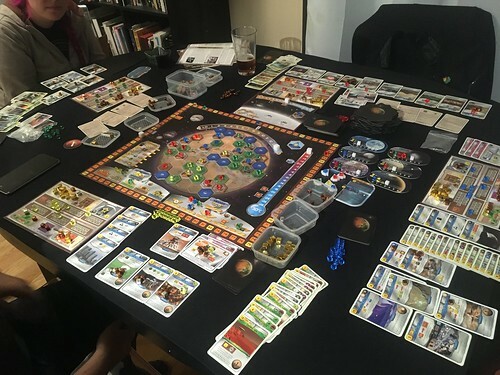 We played a lot of Scythe and Terraforming Mars this year. Mostly because expansions kept coming out for them. Naturally, they just announced a legacy version of Terraforming Mars. We’re currently in the middle of Scythe’s campaign, The Rise of Fenris. After we wrap that up we’ll probably tackle Kickstarter darling Gloomhaven. We also got absolutely abused by The 7th Continent. T.I.M.E. Stories is also regularly releasing episodes so we played the seventh installment of that series last week. I got a handful of new games. 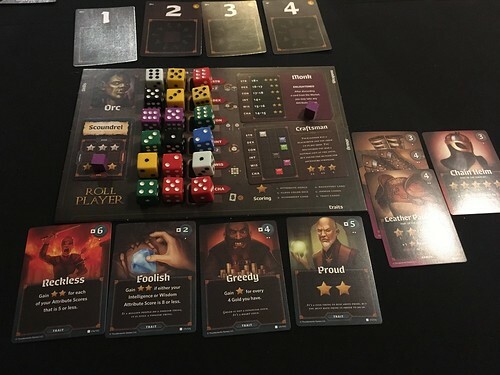 Roll Player is a meta game about building the best RPG character. You have specific class, skill, and alignment targets you’re trying to hit while allocating dice you roll to specific traits. I think the premise of the game is really funny and the dice manipulation is neat. I’ll definitely grab the expansion when it’s more available. Clank! In! Space! is a combination deck-builder and push-your-luck dungeon dive. They’ve added some elements to the original game to try and balance the pacing. I love the ability to randomize the modular board and the over the top sci fi references. I hear the expansion is also a great addition. I got my copy of the base game when my favorite online retailer, Funagain, was unfortunately having to liquidate. Photosynthesis pictured at the top of this post is a striking abstract game. 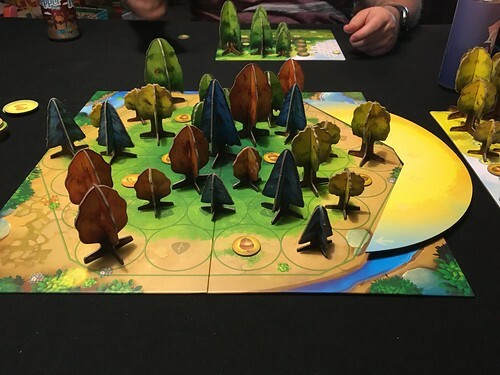 You take turns with the other players planting and growing trees. The size of the tree determines how many points it scores per round but it’s shadow can be used to block other trees from scoring points (even your own). The sun is constantly moving though so you have to think turns ahead. 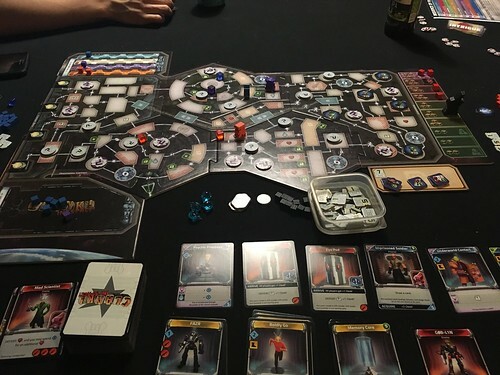 Finally I wanted to mention two “filler” games that we’ve been having a lot of fun with. 10 Minute Heist has you playing as burglars raiding a wizard’s tower. You’re trying to gather sets of treasures while not being the last out or picking up too many cursed objects. Another recent acquisition, also in the <$20 range, is Fantasy Realms. Players take turns attempting to draft the best hand of cards. The game is in trying to manipulate the cards to build the best combos while negating penalties. It’s a quick game but plays to some of my favorite parts of Magic. The card theming is really good too. I’ve got a few Kickstarter games arriving this year. I’ve only gotten into that now that the market has matured and I can back projects knowing they’ll deliver as promised. I try to take a photo of every game I play and collect them in my Flickr album. 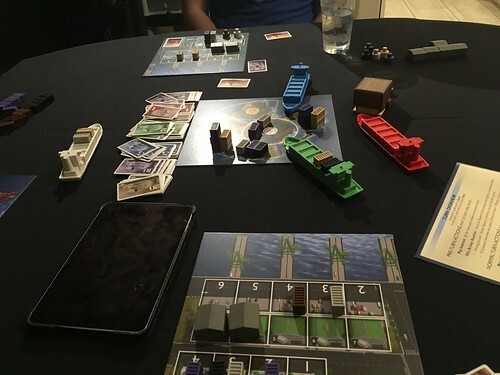 Board gaming right now probably plays as much a role in my sanity as Hacker Drinkup. They’re both fun social events with my favorite people and something I’ll continue to look forward to every week. One more thing: one of the best things you can do for your gaming experience is play on a giant piece of neoprene. You can get a 3mm thick 50×80″ sheet with black nylon on one side and the grippy mouse pad finish on the back for $55 shipped. Buy it from these folks. It softens dice clatter, is waterproof, and makes cards easy to pick up. You’ll love it. → Which Wire Strippers Should You Use? I almost bought Photosynthesis when it was cheap in December. Still might have to pick it up.